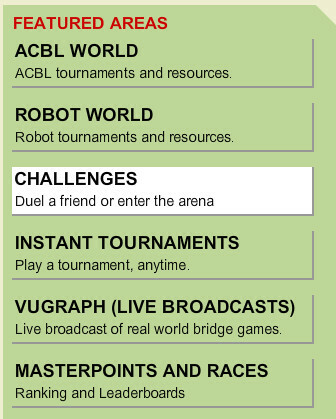 Challenges are a new and exciting one-on-one duel against a friend, a random opponent or a robot. 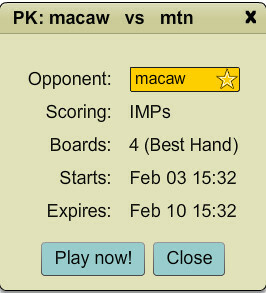 Play the same set of boards, and see who does better in your own private duplicate or total points tournament! Click the button Challenges under Featured Areas. 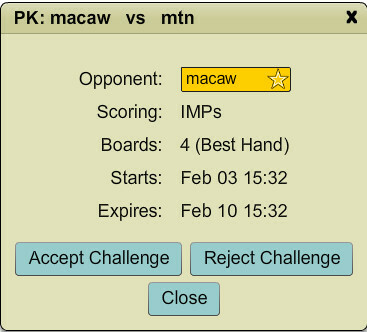 When you challenge a friend, you get to invite anyone on BBO and you can choose the type of match you're interested in. Decide on your scoring type (IMPs, MPs, or Total Points). Check the box next to the scoring type. The number of boards is variable from 4 boards to a maximum of 16 boards. Use the up or down arrow to choose the number of boards you want to play. Checking the "Best Hand" box means that you will have the hand with most high card points at the table. Fill in your friend's username in the Invite space and click the button to Create Challenge. Your friend does not have to be logged in when you issue a Challenge. You can only Cancel a Challenge if it has not yet been accepted. Once accepted, a Challenge cannot be canceled. However, Friend Challenges expire in a week if the boards are not completed. Your friend has the option to either Accept the Challenge or Reject the Challenge. If they do not take either action, there is an expiration date, one week from the date of the challenge. You can begin playing the boards once the Challenge has been accepted by your friend, but not before. If the friend you have challenged has also marked you as a friend, the challenge will be accepted automatically and you can start playing your boards right away. Challenge a stranger will launch a new type of match we call an "arena". You can select the scoring type you prefer, and you'll then be matched with a random BBOer and play 8 boards against each other. 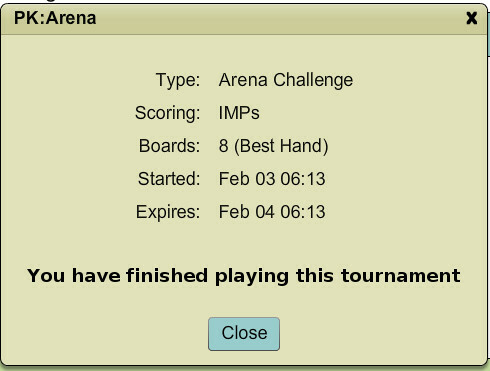 Arena challenges expire in 24 hours if either player has not completed their 8 boards. Arena Challenges are limited to 8 boards. Once an Arena Challenge is created, it cannot be canceled. You can begin playing the boards as soon as you issue the Challenge. When you start a Robot Challenge you get to play against BBO's GIB Robot. 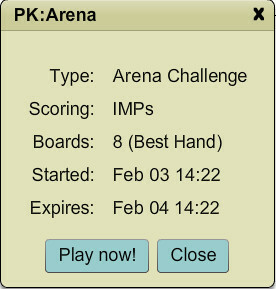 You can choose how many boards to play, type of scoring, basic or advanced robot, whether the game is Best Hand or not. As soon as you complete the challenge you will get your results. Once a Friend Challenge is accepted, it cannot be canceled. Neither you nor your friend have to play all the boards at one sitting. To begin or resume play, click the challenge, and then click Play Now. Remember, a Challenge will expire if the boards are not completed prior to the expiration date. To check the status of your Challenges when you log into the site, click the button for Challenges. Your Challenge list will be displayed at the top of the next screen. An Active Challenge shows a green dot to the far right on the Challenge bar - that tells you that you have boards left to play. Click the challenge you wish to play or resume, then click Play Now! A Pending Challenge is a Challenge which has not yet been accepted. A yellow dot to the far right of your friend's username shows that the challenge is still Pending. A Pending Friend Challenge can be canceled by the originator, at this point, by clicking the button Cancel Challenge. A Completed Challenge shows a red dot on the Challenge. A completed Arena Challenge which is still listed under your Challenges means you have played the boards but your opponent has not yet finished playing. There are limitations which we impose. You get a set number of Friend and Stranger Challenges per day, maximum. Results will be sent to your BBO Mailbox or they can be accessed by clicking the MY BBO button on the top row of horizontal buttons, and then clicking Recent Tournaments once the Challenge is completed. If it so happens that you are online when a Challenge is completed by your opponent, or if your opponent has already played all boards and you're the one to complete the Challenge, you will get the leaderboard right away, as a pop-up window, like for any tournament results. Friend and Robot challenges can now be upgraded for BB$0.25. Upgraded challenges use Advanced Robots and are not subject to free challenge limits. The challenge issuer pays BB$0.25 which upgrades both matches. If the challenge recipient is a friend or a robot, the challenge is auto-accepted, both matches are upgraded, and BB$0.25 is subtracted automatically. If the challenge recipient is not a friend, the BB$0.25 is subtracted and matches upgraded only when the recipient accepts the challenge. Bridge Base Online Help Click to return to the Index.